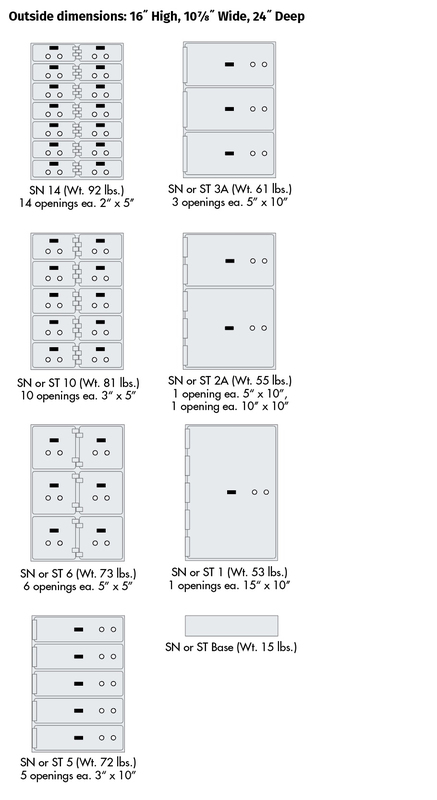 All modular cabinets are dimpled for a positive interlock or fitted together through pre-drilled holes in the frame. Stacked sections are designed for easy installation and may be installed flush against the vault wall, utilizing every inch of valuable wall space. This series combines sturdy aluminum alloy doors and frames with cabinets of rust-resistant steel. The SD and SN Series are finished in an attractive reverse hammertone silver enamel, with beige and bronze finishes available as options. This series combines sturdy aluminum alloy doors and frames with cabinets of rust-resistant steel. The SS and ST Series have a satin finish stainless steel plate bonded into a recess in the high pressure diecast solid aluminum door cast at 25,000 p.s.i. The outside rim of the door and the diecast aluminum frame are finished in a matte black enamel, providing a virtually maintenance-free finish.